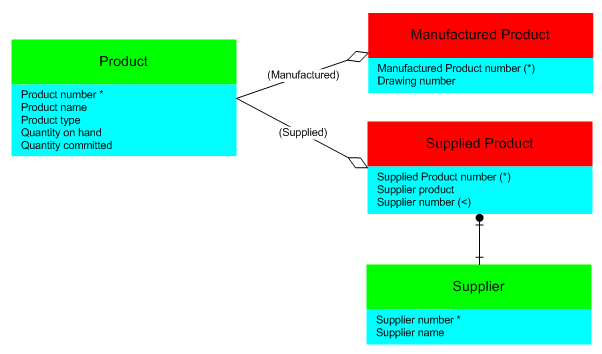 In this step, you will create a Data entity called Supplier and relate it to the Supplied Product entity. 1. Create a Data entity called Supplier. Set its physical file name to iiiSUP, where iii are your initials. 3. Set Supplier Number to be the identifying element. 4. Close the Entity Elements window. Note that, because the Product Entities Abstraction is active, the Supplier Entity has been added to the Product Entities Abstraction automatically. 5. Create a Mandatory Join (must refer to) relationship between Supplied Product and Supplier by connecting a relate shape source to the Supplied Product entity and then target to the Supplier entity. Leave its Descriptive Prefix blank.